Four Blasts in Four Weeks! 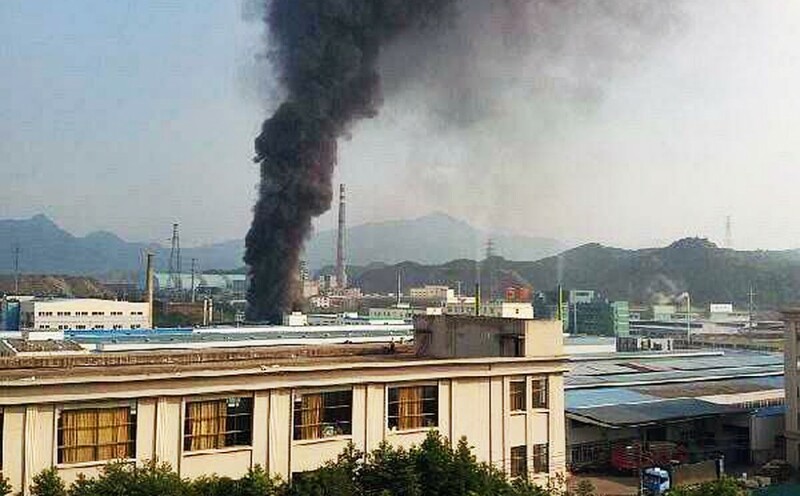 New Explosion Strikes Chinese Chemical Plant. Aftermath of Explsoion at Chemical plant in Zheijang, Eastern China September 7th, 2015. Four Blasts in Less than a month in China. For the fifth time in less than two months and the fourth time in less than four weeks,a Chemical plant or related facility has exploded in China for unknown reasons. 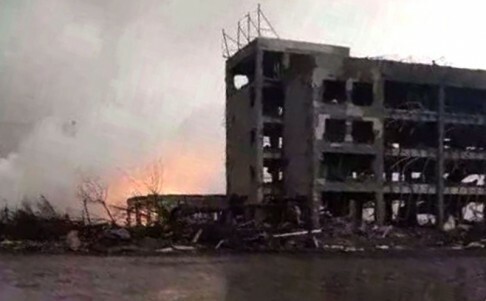 The latest explosion struck an apparent chemical plant in the Eastern region of Zheijang, there are no reports of casualties at this time. 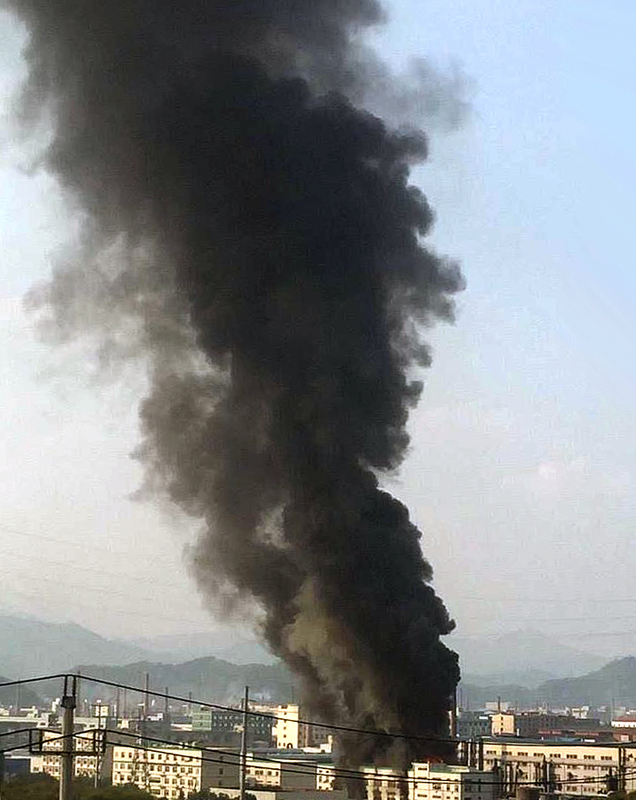 Zheijang chemical plant burns after explosion September 7th, 2015. These unexplained explosions in China are happening with monotonous regularity. While there is no doubt that China is plagued by corruption and often has lax safety standards and serious industrial accidents the events of the past month have been far in excess of the previous pattern of incidents. 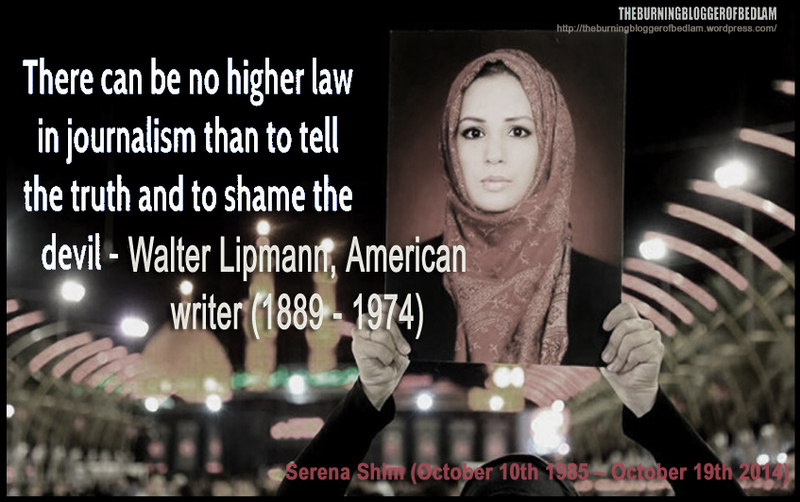 Confirmation bias on an issue like this is an obvious hazard. The Tianjin event was not an accident but it is theoretically possible that the other events represent a natural cluster of genuine accidents. There was the incident in Shandong on July 16th, followed by the catastrophe in Tianjin of August 12th, succeeded by another event in Shandong on August 22nd that was followed by the Lijin or Dongying city blast of August 31st and now another in Zheijang has taken place, along with several strange explosions in Japan it is hard not to see a pattern of sabotage taking place. New fires in Tianjin, August 31st, 2015. Very little news is emerging from the Tianjin site.but new fires reportedly broke out at the site last week after rain ignited chemicals. I found a very interesting article about the Chinese Government response to the Tianjin event, the source appears to be highly questionable and this may be fiction but I thought it interesting enough to print a lengthy quote despite the source. “Almost immediately after the devastating explosions near Tianjin Port at 11 pm, August 12, President Xi Jinping convened his closest aides to check whether there was any political motivation behind one of the most atrocious accidents in China in recent memory. At the beginning of September, the official casualty figures stand at 158 dead and 15 unaccounted for, though it is widely assumed that the number of deaths was significantly higher (People’s Daily, September 1, Xinhua, August 28; Ming Pao [Hong Kong], August 27). Three Chinese sources with the rank of head of government departments or above told the author that Xi suspected the horrendous blasts were a “political conspiracy” aimed at dealing a body blow to the zhongyang (central party authorities) led by the President himself. Senior officials advising Xi on this supposed challenge to his authority include Politburo member and Director of the General Office of the Central Committee Li Zhanshu, Director of Xi Jinping’s Office Ding Xuexiang, and Vice-Director of the General Office of the party’s Central Military Commission (CMC), Senior Colonel Zhong Shaojun. Xi, who is also General Secretary of the Chinese Communist Party (CCP), was particularly spooked by the fact that the catastrophe struck a mere three weeks before the September 3 military parade. In other words, Xi was made to lose face in the run-up to perhaps the most important public ceremony of his presidency. While the ostensible reason of this show of force by the People’s Liberation Army (PLA) was to mark the 70th anniversary of Japan’s defeat in World War II, it is also seen as the equivalent of a “coronation ceremony” for the ambitious leader. Sources told the author that while no conclusive evidence had yet been found, Xi’s advisers had focused on a military connection to the conspiracy. One factor being assessed was that the major detonations, which took place within approximately 30 seconds of each other, could not have been due merely to the chemicals being deposited at the dangerous goods storage owned by Tianjin Ruihai International Logistics (hereafter Ruihai). The Chinese Earthquake Administration reported that the first blast generated shocks equivalent to three metric tons of TNT–causing a virtual earthquake measuring 2.3 on the Richter scale. The second blast was equivalent to 21 metric tons of TNT or an earthquake registering 2.9 (China News Online, August 13). Xi’s aides gravitated to the idea that munitions belonging to PLA companies–which should normally not be found in the vicinity of any hazardous material storage–were at least partly responsible for the extraordinary strength of the detonations. One question being asked by Xi’s inner circle: were the explosions plotted and executed by “anti-zhongyang military officers” with or without the knowledge of Ruihai? In any event, all the night-shift supervisors and workers in the immediate vicinity of the storage site perished, ruling out the possibility of close-range eyewitness accounts. Tianjin Port is well-known in military circles as an important facility for weapons manfacturers and exporters such as Norinco, which on a daily basis load hardware onto containers and vessels bound for different destinations under a shroud of secrecy. The PLA’s interests in the Tianjin Port were indirectly attested to by the fact that a special work team led by the Chief of Staff of the Beijing Military Region, Major-General Shi Luze, was on the scene within hours of the incident. Shi and his colleagues provided chemical-warfare equipment as well as expertise to rescuers close to the blast site (Ta Kung Pao [Hong Kong] August 17; China Daily, August 16). However, at the same time, the Shi team appeared keen to assess the damage to PLA-owned munitions and hardware in the port area. According to Chief Brief’s sources, Xi’s suspicion has fallen on the dozens of senior PLA officers who are the protégés and underlings of two purged former Politburo members and CMC vice-chairmen, the late General Xu Caihou and General Guo Boxiong. General Xu, who died on March 15 this year, had in late 2014 been detained for corruption-related felonies including “selling plum positions” to PLA promotion seekers (BBC Chinese Service, July 30; Wen Wei Po [Hong Kong] March 9). General Guo, who is facing trial in a military court, was formally arrested in late July for corruption and disciplinary violations (Xinhua, July 31). While senior officials, including the current CMC Vice-Chairman Xu Qiliang, have repeatedly told officers to “draw the right lesson” from the cases of these two “big tigers,” associates of Xu and Guo unhappy about the disgrace of their mentors are still a force to be reckoned with within the PLA hierarchy (Hong Kong China News Agency, August 14; Phoenix TV, August 13). 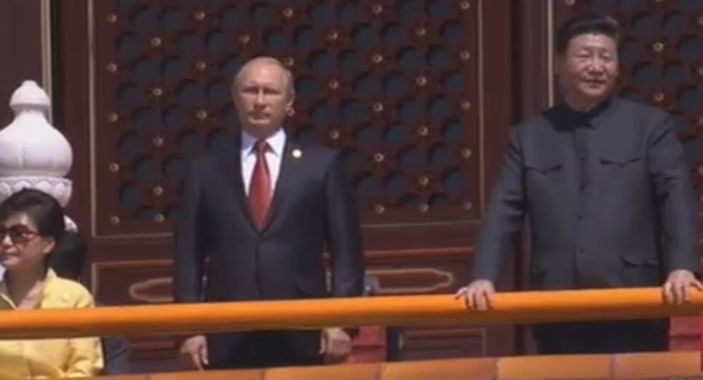 Russian President Putin alongside Chinese leader Xi Jinping at China;s Victory Day celebration. The Chinese victory parade was predictable as they all are. The event was enlivened by the presence of the Russian president and the Western media response of scowling hatred and indignation. The venom was dripping from pen and tongue alike, an indication that the China-Russia alliance is extremely displeasing to the owners of the West.